Bob Read appeared at Ferry one sunny afternoon with a FET timer which he had modified to dispense with the need for a separate 9v PP3 battery to get the motor going. To get the motor to run on the standard timer you put a 9v pp3 across the terminals of the capacitor. 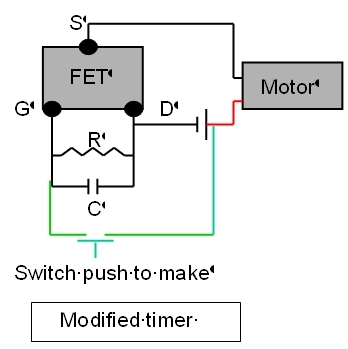 The modified timer uses the existing 2 cell LiPo (8.4v) motor battery to charge the capacitor via an additional sub micro 2 pole push switch across the battery. 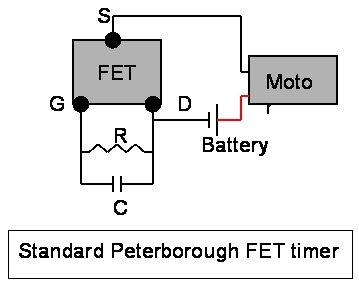 The motor run time will be a function of the state of charge of the battery voltage. A well run down pack will give a shorter motor run than expected. The resistor value should be reduced to allow for the change in battery voltage. This may not bother the sport flyer. The system does not failsafe and the motor can be restarted on retrieval via a button press and via mishandling of the model. A hidden switch under a panel with a wire push would resolve this issue. The current FET would probably be OK on 2 -3 cells. Anymore might wreck the FET. A single cell LiPo might work but needs testing to establish useable resistance and capacitance values. Here is one of the timers that Bob has assembled. The conductors labelled 'M' are motor connections. The 'B' is battery. 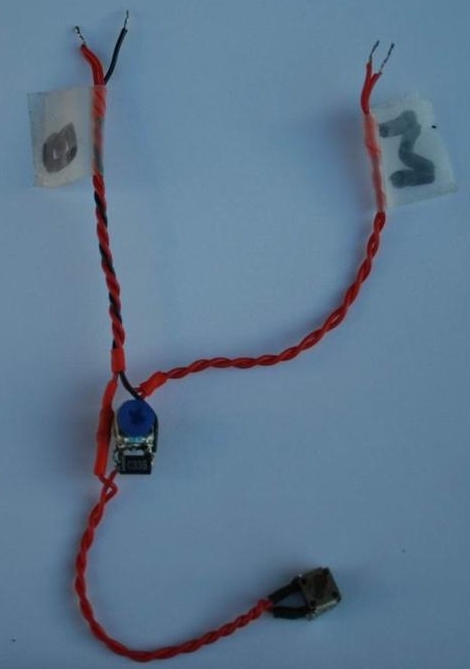 The push to make switch is clearly shown connected to the positive of the battery and the positive of the tantalum capacitor. Note that Bob has used a sub micro cermet pot instead of the fixed resistor. The switch is of the type used for direct mounting to a pcb and is readily available from Ebay or any of the major electrical factors. A very simple FET timer for brushed 6/7mm pager motors.